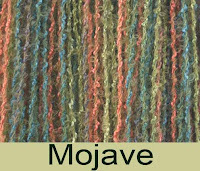 Yarn and Fiber Happenings: Prisms Newest Colors - They Just Get Better and Better! Prisms Newest Colors - They Just Get Better and Better! Prism just sent us there three new colors of Stuff for the season. 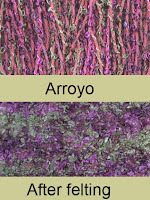 - Cabernet, Moss and Sierra.....What Gorgeous colorways! Moss reminds us of Tumbleweed (a favorite here) without the eyelash and the purples.... just those wonderful greens.... this yarn is yummy! We also had them ship us some Felt Me! and Loopy - each are feltable yarns that when felted the rayon comes to the surface and makes a wonderful fabric - we are all scheming about what we should make with this yarn... some say a Felted Fall Jacket others are thinking of felted purses. I think anything we make will come out fantastic! Here is a a picture of the Loopy in Arroyo and the Felt Me! picture is shown in Mojave. The Loopy is much brighter than the Felt Me! 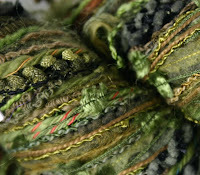 but both are wonderful.... Stop by and see some... we would love your suggestions on what to make with this fabulous yarn!